I have worked on my garden off and on the last few weeks, but it seems that no matter what my priorities for the day might be I find myself doing something with my garden project. And it is a project, to be sure. First off, the things that grow best here are rocks. Creating any suitable growing space requires digging and lots of it. Even when the boulders and large rocks have been removed the dirt needs to be screened to remove the next batch of rock, leaving mostly pebbles. Organic compost of some sort is a must, otherwise it is just pebble filled dirt, not even close to soil. Then there is the fence issue, or rather the lack of fencing issue, which means the deer are compelled to sample everything including the leaves of my tomato plant (yuck) to the “deer resistant” plants that I put in for color. Undaunted, I plug away. I realized this evening as I transplanted my basil seedlings ever so carefully that this is my outlet for the nurturing part of my soul. 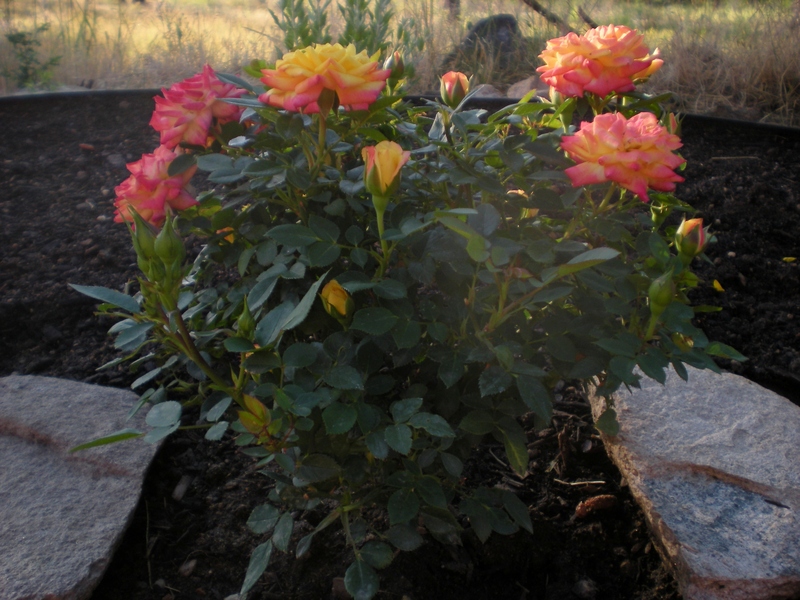 Each night I carefully cover my rose-bush with a 30 gallon garbage can weighted with rocks; I knew rocks were good for something! 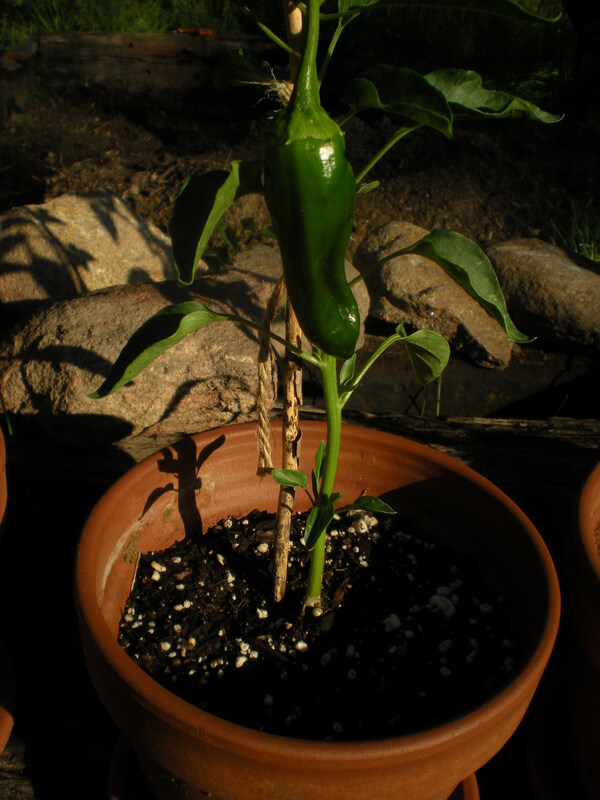 All of my veggies that I have here at home are in pots, which are nightly placed in the shed, then brought out at first light each morning. As I did this again this evening, it dawned on me that the need to care for something is a deep and abiding part of who I am. Yes, I take pleasure in the visual result of the products of my labors, be it a clean house, the yard neatly trimmed or the myriad tasks that take my time and effort. But that I wander back to the garden to pluck a spent bloom, stake a drooping pepper plant, or work just a little more compost into the soil, speaks of something deeper than the esthetics or practicality of gardens. To nurture nature and all that it holds and symbolizes, and to allow nature to nurture me, is to bring myself and this place to harmony and balance. In the greater picture it seems that it is not a debate of nature vs. nurture; they are not adversaries. It is instead how the nature of a person or place is brought along to be their fullest and most beautiful self as a result of kind and mindful nurturing. To be fully present tending our garden of lovely blooms, be they persons or plants, giving all of our attention and care in that moment, is to be the help-mate of nature in all of its splendid variety. Isn’t it one of the lovely circles of life that the beauty we take in, we hold, and it in turn allows us to see and experience more beauty in all things? I am privileged to live in a most beautiful place and it has opened my heart to other beauty in my life. The beauty of a group of 15 kids ranging in age from 5-12 working together and helping each other in our community garden in our Libray Kids in the Garden program. One child has profound hearing loss and speech difficulty, yet was easily welcomed and included by all the others. The youngest seems painfully shy, yet found his footing with the help of another child a couple of years older. The two oldest, where there seems to be a marked difference in maturity, hung together at first, then realized the younger ones were struggling with the scavenger hunt and split up to help the younger ones. All of this coöperation, with not one episode of unkindness or lack of enthusiasm, was truly a thing of beauty. As the weeks go by and our tomatoes, carrots, broccoli and assorted other goodies begin to ripen and the kids get to know each other better I expect there will be more moments like this. This day, which was glorious in every way, with warm sun and clear skies, came on the heels of gray day after gray day, punctuated only by rain and wind. I felt deflated and filled with the kind of gloom that only a long Montana “sprinter” (spring on the calendar – winter outdoors) can induce. Then suddenly sun, smiling excited faces, and my hands in the dirt to turn it all around in a quick two and a half hours. This morning we are back to “sprinter” even though summer is only days away, it is wet and cool again. But the beauty lingers in me and I see how green the grasses and trees are, washed clean overnight; and the wildflowers continue to burst forth with the long hours of daylight with or without the sun. Continually watering the inner garden and filling oneself with every moment of beauty and tranquility grows inward radiance becoming one’s gift to the outer world as well as to oneself. Add a full mix of care, compassion, hope, joy, wonder and beauty of all kinds. The more one contains of the positive the less room to hold anger, sadness, cynicism or indifference. Taking care what is added to the container, mindful that all that one contains colors all that is seen and done; choose wisely.